Thoughts on Two Years | Nicole, Deipnosophist. My sweet daughter turned two on 15 August. It was the weekend of GenCon of course, and the house was full of guests (the way I like it). “You’re still going to Gen Con?” people said, a twinge of disapproval in their tone. “Yes we are!” I cheerily replied. After all, I wasn’t just dragging her around in a feeble attempt to maintain my hobby; I actually registered her into a kid’s event where she made a handprint from special clay. She looked around with wonderment. She wasn’t afraid at all; more like, inquisitive and absorbing. I wonder at what age she’ll realize that these 30,000 people aren’t all in Indianapolis for her birthday. Ainsley fearlessly walked in the crowds and it’s a wonder she wasn’t pushed aside. I haven’t been able to carry her due to my hip injury but she loved navigating the crowd. She then perched atop Jason Siadek’s shoulders to get a better view of her party. She soaked it up and loved when people stopped her to take pictures. The differences this year have been huge. Last year, she barely walked; this year, she ran and talked and looked and talked and and and. I was so happy to see her enjoy the day. After the clay sculpting, we headed to PF Changs where she ate everything in sight and had her first French conversation with someone other than me (thanks again to Mr. Siadek). Look at this lovely party all for me, Mr. Siadek! Ainsley reminds me why I’m doing this by saying things like “Mommy says ‘je t’aime’ to say ‘I love you. '” I’m not trying to prove anything. I’m using what I know to provide her brain with new things to learn every day. Her favorite book, Green Eggs and Ham, is also on the shelf as Les Oeufs Verts au Jambon. She almost always asks to read both in a row and calls one book Sam-I-Am and the other Sam-C’est-Moi. She even took both of them for quiet time, and spent over 20 minutes comparing them, page by page, to understand the differences. I’m so happy she is interested and as long as she still wants me to read in French, I will endure the criticism and give my little girl the opportunity to learn more than one language. 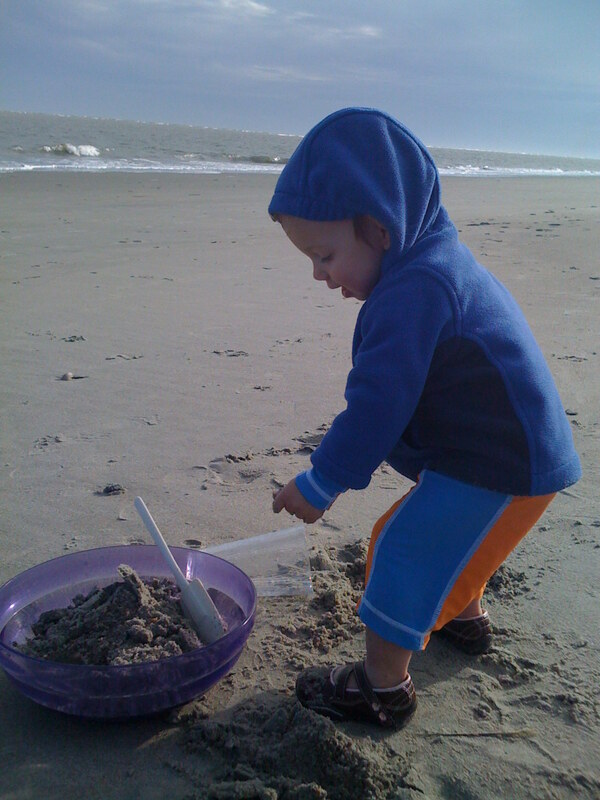 We are in Charleston again on vacation, and we’ve spent some time at the beach. I couldn’t help but compare the photos this to the photos from just ten months ago. Yep, she’s wearing the same swimsuit! This year, the sleeves don’t need to be turned up and the bottom fits her little legs, hitting just at the knee. I also loved seeing the difference in her activities. Last year, she was entranced by sand only. 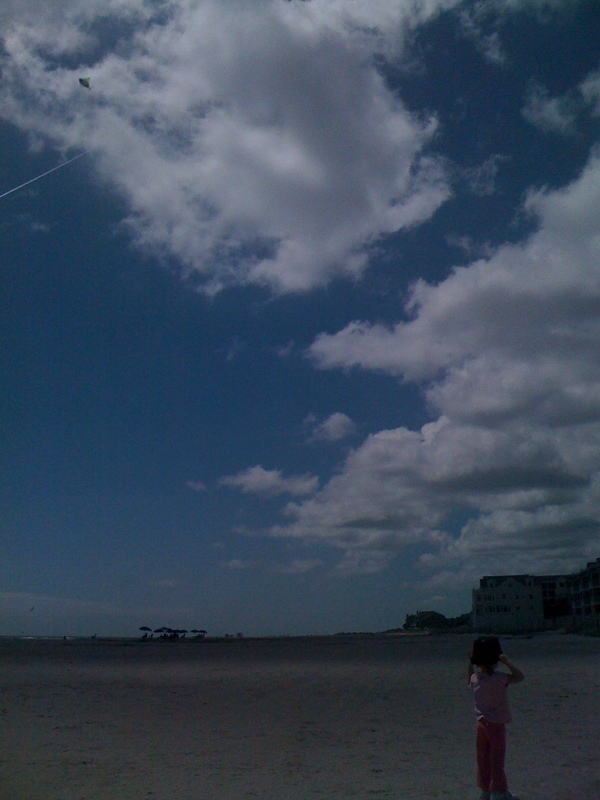 This year, she’s taking in the ocean (even though it scares her) and waving at the far-off moon (see the photo at right). She is increasingly open to people and says hello to many. “I’m jumping in the pool!” she’ll happily exclaim. everything more, and to focus on the simple. No more working on weekends (even if I only worked while Ainsley slept). No more worries if my house looks perfect or my hobbies are flourishing. Time to focus on the little things, which quickly add up to be the only big things. You’ll recall from my last Ainsley post that she and I struggle to understand each other. We still fight and the tantrums are worse. I learned recently that I really do let her whine, and she knows how to push me. It’s incredible how intuitive she is. I’m learning to stop and educate, and sometimes, to just leave and let her cry it out if she needs it. I’m giving more clear instructions and sticking to them. In short, I’m giving her the tools to make the choices in life that she can make, and explaining those things where she doesn’t get to make the choice. During tough conversations I often revert to English because it’s faster; now, I’m trying to slowly explain in both languages, so she doesn’t associate my English with hard times. The Montessori method is still a huge part of our household, and Ainsley’s teacher makes a big impact there. She’s not only Montessori trained but also has a gentle, loving spirit that is certainly impacting Ainsley’s worldview in a positive way. She gives me ideas for activities, encourages my creativity, and looks at things differently, challenging me to incorporate education into every day and also to stop trying so hard sometimes, and simply to be with my daughter and watch her explore. Ainsley also has a second, part-time teacher, who adds another unique dimension. Ainsley has so many people in her life who are all cheering for her. Ainsley flew a kite today! It was her first real flight and the kite was so high she was a bit scared. I think she knows that in her favorite book, Tiny Bear Goes to the Fair, the kite-flyer is taken into the air my the kite. She even mentioned little Tiny Bear. After mentioning him, she handed me the string and told me to do it. I’m trying to start incorporating more charitable work. Sure, we pray, we go to church, she has love for animals, but it’s time for her to do things like go to animal shelters and help. Even if I’m doing the work while she giggles at animals, it’s a good habit for her. I have been too “busy” to do several things with my friend Amy and I want to do better. I only wish our beloved Khyati were still here, lending her brightness and love and experience. Surely I’m overthinking all of this. I know it. But I can’t let any more moments pass unnoticed, in this amazing life that is Ainsley. You seem to have relaxed in your philosophical assessment this time. I think all the stuff you do w/A is great and I’m glad you’re not apologizing for being ‘busy.’ Also you are in my Reader so you can’t post w/o us knowing! I think it’s great that you are teaching her French from the get go. I don’t think it’s rude when you speak in French with her and don’t let the eye-rollers slow you down.